A recent egg recall is a reminder of this. While your server might be serving up Norovirus, your pre-packaged or processed foods might have grown enough bacteria to give you regular old food poisoning. Norovirus is virulent and easy to catch—symptoms like vomiting give it the most distance, but it can spread by touch (unclean clothes or unwashed hands), too. Norovirus comes with flu-like symptoms, knocking you out with fatigue, aches, and stomach pain. 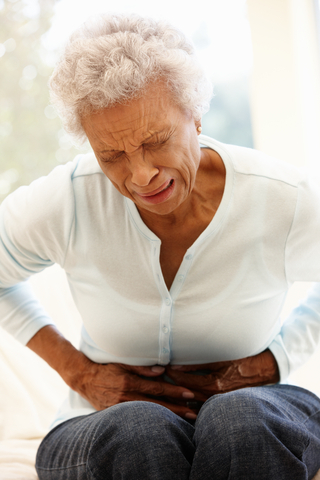 Food poisoning doesn’t always come on immediately (but it can). Food poisoning might take as much as two weeks to start (having a strong colony of healthy gut bacteria can help fight it off). Then stomach cramps, vomiting, and diarrhea begin. With both Norovirus and food poisoning, it’s important to stay hydrated. Electrolyte drinks (coconut water, pedialyte) help replenish fluids more quickly. Avoid food poisoning and Norovirus by avoiding restaurants with sick servers, and avoiding processed foods (including pre-cut fruit). Because you can’t always predict and avoid exposure, keep your immune system defenses strong too—especially your gut bacteria, which are the front line of defense against any pathogens you accidentally eat. Healthy habits support the growth of healthy bacteria, but you can give them a boost and replenish your colony with a sipportice probiotic like Flora MGR. With two types of stomach illness to watch out for, make sure that you have Flora MGR on hand to boost and replenish your gut colonies (especially after an illness! ).